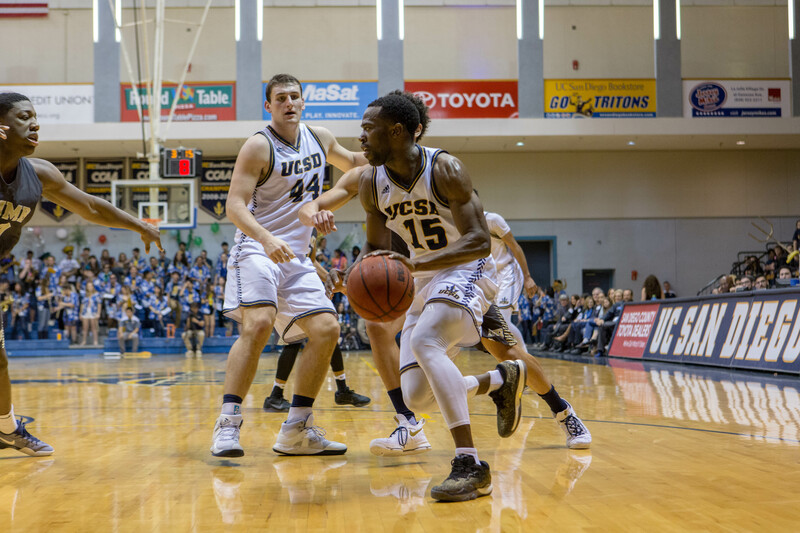 After a recent four-game stretch in which the UC San Diego men’s basketball team lost three of four games, the season seemed to have gotten tougher for the Tritons. However, the team has responded brilliantly ever since then: A four-game win streak has transpired with it recent two wins coming over the weekend. A two-game road trip to LA County ended with an 82–70 win over Cal State Dominguez Hills followed by a narrow 86–84 victory over Cal State LA. The Tritons now stand atop of the California Collegiate Athletic Association standings with a 14–3 conference record and, with only three games remaining in the regular season, they will fight to maintain the top seed. With the wins, the Tritons clinched a spot in the upcoming CCAA tournament and a home quarterfinal on Feb. 28. A red-hot shooting display from the Tritons propelled them over Dominguez Hills on Thursday night, having never trailed in the contest. The dominant display from UCSD gave them their third consecutive win. While the Toros shot a decent average on the night (47.5 percent), the Tritons simply outshot their opponent with an incredible season-best 64.2 percent from the field. Additionally, UCSD had no problem from behind-the-arc as they drained 56.3 percent of their three-point attempts (9–16). UCSD’s scoring was led by 15 points from sophomore center Chris Hansen (7–9) and 14 points from freshman forward Scott Everman (6–8). Junior guard George Buaku added 11 points meanwhile, senior guard Adam Klie had another solid performance overall with 12 points, six rebounds and seven assists in contributing to the team’s win. Although the Tritons shot lights-out, the Toros cut down a 25-point deficit in the second half to seven points, nearly completing an outstanding comeback. However, UCSD’s shooting ended up being too much for Dominguez Hills. While UCSD head coach Eric Olen was pleased with the team’s offensive display on the night, he did not feel similarly about the defense, specifically in the second half. “We could have executed better defensively, but Dominguez Hills deserves credit for creating problems for us and fighting back. We feel fortunate to have held on and come away with a road win,” the coach said after the game. UCSD once again continued its superior shooting over its opponents on Saturday night, shooting 51.7 percent, ultimately helping the team earn yet another victory. Cal State LA, similarly to Dominguez Hills, nearly pulled off a double-digit comeback win in the second half, but the Tritons did just enough to hold on. The Tritons led by 14 points with under 10 minutes of play remaining but, near the end of the quarter with a few seconds remaining, that 14-point lead had disappeared into a one-point lead. The Golden Eagles had ended the game on a 31–18 run in order to put themselves into a dangerous position for the Tritons, but Hansen’s clutch free throws in the remaining seconds clinched them the win. Hansen filled up the stat sheet on the night with 24 points (8–13), 10 rebounds, one block and one steal — his fourth double-double of the season. Four other Tritons hit double figure scoring, including Klie (15), sophomore guard and forward Christian Oshita (15), senior guard Aleks Lipovic (12) and Everman (10). The Tritons now return home to end the season with a couple of games. On Feb. 17 they will take on Cal Poly Pomona and Humboldt State on Feb. 18. With tip-offs set for 7:30 p.m., UCSD will attempt to end the season on a high note — given the upcoming postseason, the Tritons will want to have as much momentum as possible.